I hope to study Med, iA, so I was just curious to know how the course actually is...I mean hordes of people shy away from Med due to the general idea of "unrealistic workloads, crazy work & study hours, sky high expectations..." and most of all of "all those years spent to simply get a Bach. Degree." I can certainly admit, that such talk, at the very least, sounds quite daunting. I googled around and found this on TSR. Honestly, this kind of environment, though hectic, does seem interesting, especially the dissection part. "Was it Hard? Well, it certainly wasn't a cake-walk, but it shouldn't be too much to handle. You aren't thrown in at the deep-end with a bucket-load of biochemical equations and left to figure it out. In the first year, they'll ensure you have the basics down - even if you didn't do A-level biology, the basics will be integrated with the degree-level content so even if you are a bit behind others, you'll eventually cope with it fine. Some people are more 'intelligent' academically than others, but if you got into medical school, you should be fine - don't worry about how 'clever' others around you seem. They will actually usually be keen to help out if they are catching on quicker. It's by no means easy, but it shouldn't be impossible. You will struggle with something at some point, even if it's not in the first year, unless you're very lucky. Your friends and the medical school will help you out if you need it - the work is hard, but you will cope." Friar Chris. 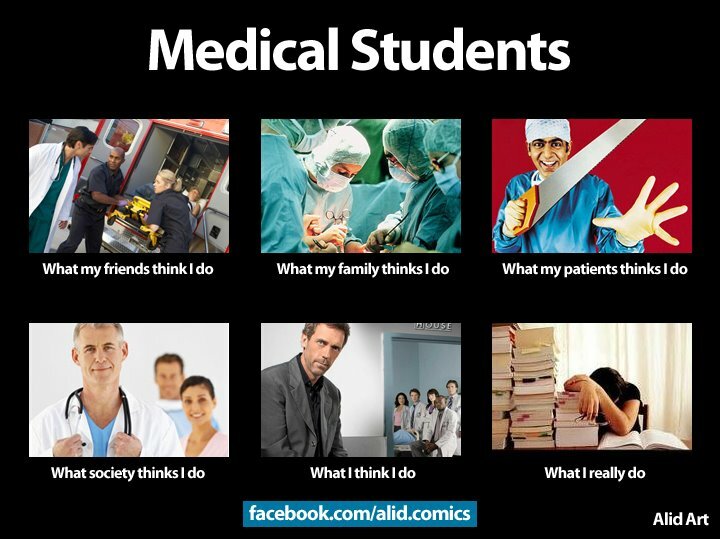 I'm assuming Med schools everywhere are more or less similar...What do you guys think? Re: Life as a Med Student? How does it feel? Life as a med student? Like this? I'm not a true medicine student but I belong to the Health-care sector, and trust me, there's no major were you dont have to work your rear off. Medicine is not difficult (its a subjective term, really); its interesting and loads of fun. So, whatever negative you hear, ignore. People are always going to pull you down, scare you off but it depends on you - how you make of the situation. Good Luck and pursue your dreams. Take it easy! What makes you think he's not exaggerating? Because I belong to a medicine field as well so I know how it is. Why are you here, now? You get the right one, theres nothing like it.